Meater Thermometer Reviews - Cook The Perfect Meat? 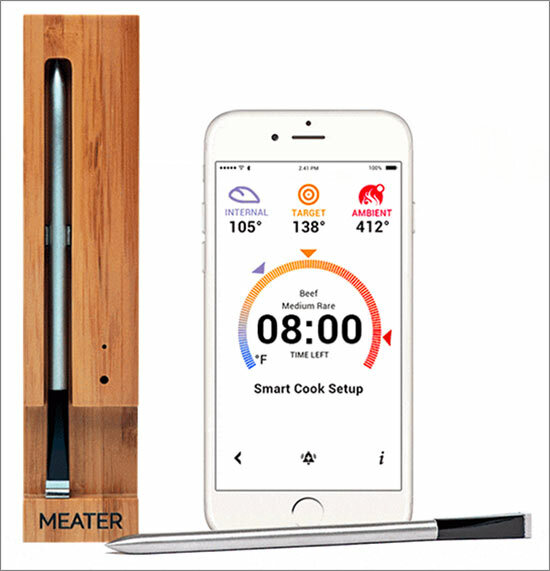 Created by Apption Labs, Inc., the Meater thermometer uses core and ambient sensors to transmit temperature data to your smartphone, and help you cook the perfect cut of meat. Meater Thermometer Review - Cook The Perfect Meat? Advertised as the first wireless smart meat thermometer, Meater Thermometer promises to help you track your cooks and achieve perfect and consistent results every time, without complexity or fuss. The website explains you just insert the patent-pending probe, set up your preferences in the app, and start cooking. Using dual sensors that concurrently monitor internal and ambient temperatures, the Smart Guided Cook system promises to walk you through every step of the process, including estimated cooking time, as well as “carry over” cooking for perfect results. And you can monitor everything from afar via the iOS and Android apps. You can even extend your wireless range and monitor your cook across multiple smart devices by combining the Meater Link device and Cloud support with Bluetooth 4.0, Wi-Fi, and the app. After raising more than $4 million between their 2015 Kickstarter and Indiegogo campaigns, and now selling their systems through retailers like Amazon and The Grommet, Meater is a classic crowdfunding success story. Based on your needs and preferences, though, can you expect it to deliver a high level of value? We'll walk you through the details step-by-step so that you can come to your own conclusions regarding essential questions like these. How Does the Meater Thermometer Probe Work? The Meater system is comprised of three main components: the probe, the app, and the charger. The exterior of the probe's shaft is constructed from stainless steel and looks somewhat like a slim, elongated bullet (5.1” long, 0.23” in diameter, and weighing in at 0.7 oz.). Because of its size, the manufacturer strongly recommends that your cut of meat be at least one inch thick for best results. The handle is made of ceramic that can withstand ambient temperatures up to 527°F, which is measured via an internal sensor at the back of the device. Inside-the-meat temps (up to 212°F) are monitored using a second built-in sensor located about one-third of the way up from the tip. 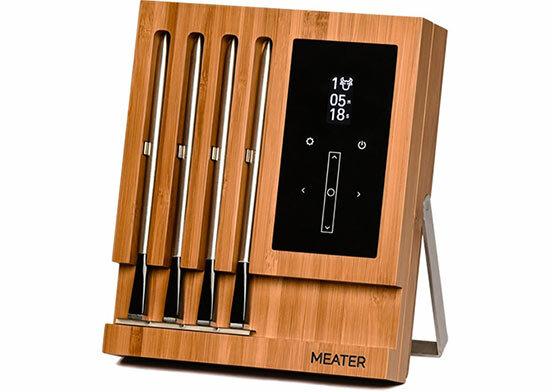 The combination of Meater’s stainless steel probe, charger made from real wood, and app connectivity help the system let you know when your meat is perfectly done. Credit: Apption Labs, Inc.
You can access all of the data accumulated by Meater’s probe via the app (more soon), which will work up to 33 ft (10 meters) away using a Bluetooth connection, or up to 165 ft (50 meters) with a Wi-Fi connection. Add the Meater Link and the Meater Cloud, and you could achieve unlimited wireless range as long as you have phone reception. Keep in mind that connectivity distance is impacted by what you’re cooking in, since some containers, such as kettle grills and smokers, block RF signals much better than other cooking sources like ovens, gas and Kamado style grills, stove-top grills, and rotisserie ovens. Other factors that could impact reception include the type of device you’re using, the wall materials between your device and the probe, and the number of walls. Meater’s probe will last more than 24 hours on a charge, and when the time comes, its real-wood storage charger (157mm L x 37mm W x 28mm H) operates using one AAA battery and promises to recharge the probe to full about 100 times, or enough for about one year of regular use. The outside features a discreet LED battery indicator, while the opposite side uses a magnetic backing to attach to a wide variety of metallic surfaces. What’s Different With the Meater Block? Meater Block uses the exact same sensor technology found in the standard thermometer—it just provides customers with a total of four probes. Its real wood case stores and recharges all four of these sensors at the same time (5.2” L x 1.54” W x 6.18” H), and operates using four AAA batteries. However, there are some meaningful differences. For example, you can use Block’s sensors without a smart device, and its storage case features a built-in Wi-Fi extender for long-range communication, an OLED display with touch capacitive control, and built-in speakers for audible alerts. Compared to the standalone model, Meater’s Block Charger boasts the ability to store four probes at once, longer-range communication capability, an OLED display, and speakers. Credit: Apption Labs, Inc. According to the instruction video on the Meater website, you’ll start by positioning the tip of the probe at the center of the thickest part of the meat, making sure the safety notch toward the back is entirely inside the meat. Behind this notch is the probe’s black end, which houses the ambient temperature sensor and should be placed two inches from the meat’s surface. 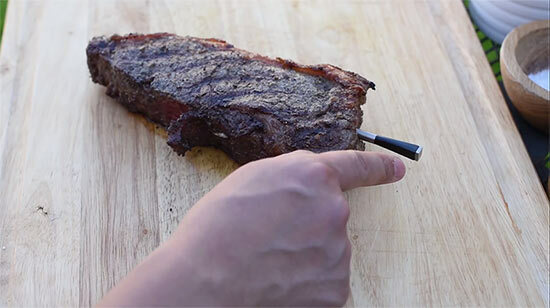 In this screenshot taken from the Meater instructional video, we can see the probe’s tip inserted into the thickest part of the meat, with the safety notch completely hidden and the back end about two inches away. Credit: Apption Labs, Inc.
After launching the app, you can set up a guided cook, which uses an advanced estimator algorithm that allows you to choose preset meat temperatures and receive automatic alerts, leaving you with consistently optimal results. Simply select the type of meat and temperature, and then start the cook. The app will display the ambient temperature reading, internal temperature, as well as target temp, which will correspond with a dial indicator on the left side of the screen. Here, you’ll also find estimated time remaining, which you can toggle to show elapsed time. You can even create custom alerts by tapping on the Alert icon and view a graph icon that displays a visual representation of internal and ambient temperature. Available for iPhone and iPads (iOS 9 and later) and for Android devices (5.0 and later), Meater’s mobile app can pair with up to four probes and help you monitor internal and ambient temperature for perfect results. With only one burner on, you’ll then place your piece of meat (with the probe still inside) over indirect heat and at least two inches away from any wall. Based on your chosen settings, you’ll receive an alert when your meat is ready for removal from the heat, at which point it will instruct you to allow it to rest. When resting is complete, you’ll receive another alert. Finally, when removing the probe, take care not to apply perpendicular force up, down, left, or right. Just pull it straight out, or you might risk causing damage. The company emphasizes that Meater’s probe requires cleaning after each cooking session, which helps ensure the charging contacts are free from debris and are ready for use. You can wash the probe under running water and enlist the help of a sponge and mild dish soap to remove any accumulated debris, as long as you don’t submerge the probe for an extended period. The manufacturer recommends scrubbing the square ambient tip entirely using the abrasive side of the sponge to remove any soot or transparent layers of oil. Once finished, dry the probe with a soft cloth or paper towel. How Much Does Meater Cost & Where Can You Buy? Whether purchased directly from the company, or third-party retailers like Amazon and The Grommet, the single-probe Meater system is priced at $69. This includes one charger and one AAA battery. The Meater Block (estimated shipping Q4 2018) is priced at $199 and includes one Block charger, four probes, and four AAA batteries. All direct purchases come with a 30-day refund policy, less S&H charges and a 15% restocking fee. Third-party details could vary. Regardless of where you buy from, Meater comes with a one-year limited warranty against defects in parts, materials, and workmanship, which begins on the date of purchase. You can request either of these by emailing support@apptionlabs.com or sending a message via the contact form on their website. What Are Online Customers & Professionals Saying in Their Meater Reviews? We encountered more than 440 combined reviews between iTunes and Google Play for the Meater app at the time of our research, who had given it an average rating of about 4.3 stars. Compliments frequently referenced ease of use, accuracy, improved cooking results, and wireless functionality. The relatively few complaints tended to reference that the probe’s size made it less than ideal for specific cuts of meat (e.g., filet), as well as connection problems and app crashing. We encountered more than 100 additional customer reviews for Meater between Amazon and The Grommet, who had given it a lower average rating of about 3.5 stars. While compliments often mirrored those for the app, additional complaints included range concerns (typically, no more than 10 feet). The Meater leave-in thermometer system has also been reviewed by a wide variety of popular media outlets, including Wired, Men’s Health, CNET, Tech Hive, and Business Insider, to name just a few. Wired's Joe Ray gave the device four out of 10 stars, complaining about its connectivity, much lower heat tolerance than competing traditional options, and the fact that there's no base station, so you have to look at your phone every time you want to know the temperature. Still, he noted that it delivered perfect pork chops, but it was of limited use when it came to brisket. Most other media outlets gave Meater glowing reviews. Men’s Health’s Sean Evans gushed over the device, calling it the “best thermometer I’ve ever used.” Although it worked flawlessly, he had a small gripe about connectivity, which ranged between 10 and 30 feet, depending on where he was cooking. These connection concerns seemed to carry over to other outlets as well. 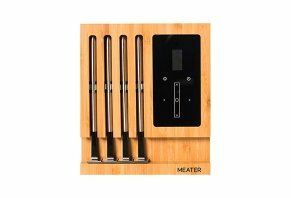 Are There Other Wireless Meat Thermometers Like Meater? While there aren’t any other options designed exactly like Meater, we encountered two competitors that ticked many of the same boxes, including the ability to remotely monitor temperature via easy-to-read displays, app connectivity, timers and alerts (preset or custom), multiple sensors to simultaneously read more than one temperature, and standup functionality and/or magnetic backing. While these devices share many similarities, we can see based on the information above that there are several meaningful differences. And we think the emphasis you place on these differences will go a long way toward determining which one—if any—is right for you. For example, Meater is the least expensive, depending on your budget. It’s also the only one that’s completely wireless, which more than one customer emphasized significantly improved maneuverability while cooking. On the other hand, Smoke Gateway is the most expensive and is only designed for medium-heat applications (not grilling) and iOS devices, but it boasts the longest transmission distance (up to 300 ft). It also appears to be a professional-level device (we didn’t test any options firsthand) that could be complicated for a novice to use. iGrill2 offers by far the broadest operating temperature (22° F (-30°C) to 572° F (300°C), which could potentially broaden its applications. It also comes with a 150 ft Bluetooth range, without requiring customers purchase additional hardware; delivers a 200-hour battery life, and can simultaneously monitor up to four different pieces of meat. Let's pull everything we've discussed together and come to a conclusion about the Meater thermometer. What's the Bottom Line For Meater? With its patented combination of completely wireless functionality and uni-body setup with built-in core and ambient temperature sensors, not to mention an ultra-competitive price, there seems to be a lot to like about the Meater thermometer. Just like any other product, though, no single device will meet everyone’s needs. And even among options that might represent your ‘best’ choice, some give-and-take can still be involved. For this reason, it’s positive that Apption Labs stands behind Meater with a 30-day refund policy if it doesn’t meet your needs or preferences. Based on what we learned on sites like Amazon, The Grommet, and Men’s Health, it also seems to come with mostly positive online customer feedback. However, you’ll have to pay for return shipping to the manufacturer if you decide to request a refund, as well as a 15% restocking fee (about $10.35), so it’s not a completely risk-free process. We think you should factor these expenses into your budget before making a final decision. When first using the product, the wireless range was spotty, requiring the smart device to be within 1-2 feet of the thermometer. After a back and forth with the company with no satisfaction, it now no longer works at all. Despite this, the company continues to ask me to try this and that. I am guessing that they are trying to run out the clock on the warranty. I have never had a company not stand behind their product like this one. Write a Review for Meater Thermometer!